‘abdu’l-bahá | bahá'í children's class ideas! ‘Abdu’l-Bahá is a very special person: He is the Centre of Bahá’u’lláh’s Covenant, the unerring Interpreter of His Writings, and the Perfect Exemplar of His Teachings. He was given many titles during His lifetime, including “The Master”; the one He preferred and took for Himself, however, was ‘Abdu’l-Bahá, which means “Servant of Bahá”—Servant of Bahá’u’lláh. Mon nom à moi est ‘Abdu’l-Baha, by Lucie Dubé. 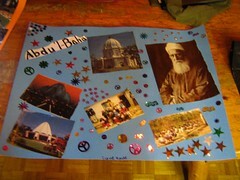 What Would ‘Abdu’l-Baha Do? (Version française: Que ferait ‘Abdu’l-Bahá?) A simple exercise that helps children reflect on some of ‘Abdu’l-Baha’s character qualities.